Bus from Shah Alam to Taiping is most convenient mode of transport to travel between the two cities. Many locals prefer to take direct express bus from Shah Alam to Taiping because there is no flight and direct train service available to travel between the two cities. By taking the direct bus from Shah Alam to Taiping, passengers save the time from having transit in Kuala Lumpur or Ipoh. Starmart Express and Konsortium Express are the two bus operators serving bus from Shah Alam to Taiping. Starmart Express is the dominant player in this bus service by providing up to 8 daily departure while Kosortium Bas Ekspress only provide one daily departure. D Amour is an agent managing other express bus brand to operate bus from Shah Alam to Taiping. 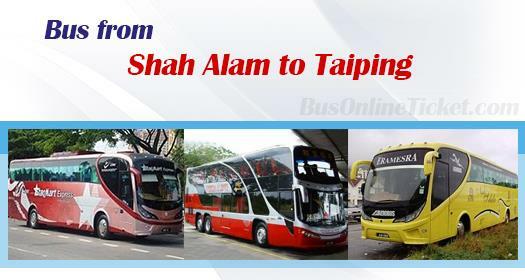 Duration required for bus from Shah Alam to Taiping takes about 3.5 hours, depending on the traffic conditions. Washroom break will be given upon request from the driver during the journey. The bus from Shah Alam to Taiping is charged in a range of RM 30.00 to RM 38.00, depending on your selection of bus operator. Coaches deployed by Starmart Express and Konsortium are all VIP bus with spacious seating. The departure point in Shah Alam is from Shah Alam Bus Terminal. Passengers can easily access to Shah Alam Bus Terminal via intercity bus and taxi. The arrival point in Taiping is either at Medan Simpang, Simpang Taiping or Kamunting Bus Terminal, depending on your choice of drop-off point. Due to high demand of bus from Shah Alam to Taiping, booking bus ticket online with BusOnlineTicket.com now to secure your seat and cut short the waiting time. You will receive instant confirmation upon successful payment. Booking online has now been made easier with BusOnlineTicket.com.